My kids, all teenagers now, have been a huge help so far this holiday season. They let me sleep in the day after we got all the Christmas boxes down from the attic and surprised me by already having the tree up and decorated when I woke. 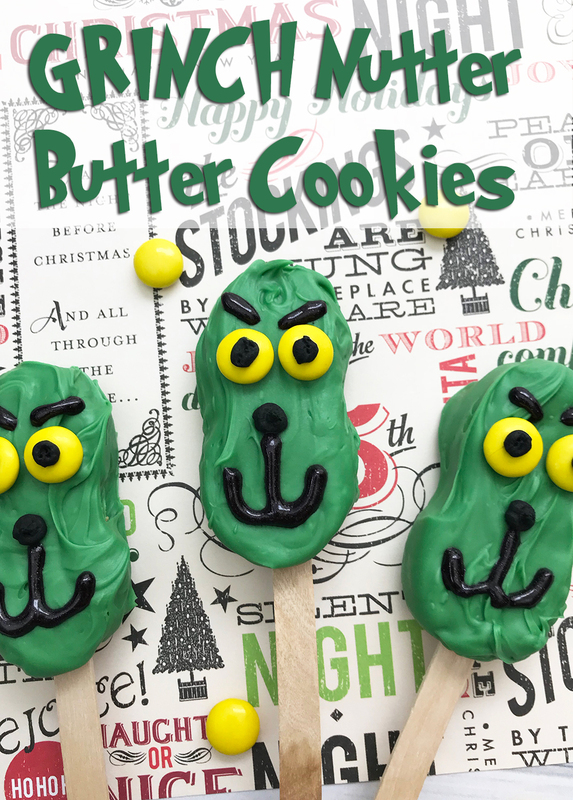 Now they’re really in treat making mode so we made these super fun Grinch Nutter Butter cookies. Apparently they’ve decided they were so good that we’ll have to make some more then go see the new Grinch movie! 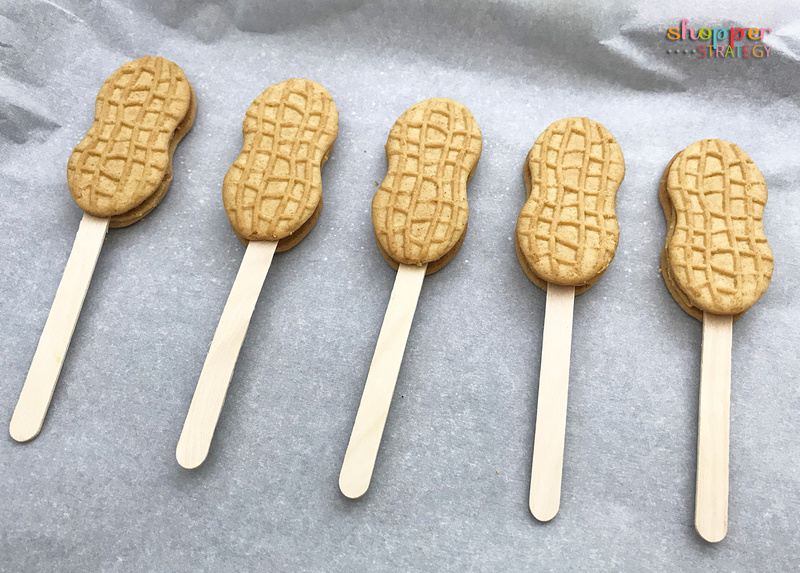 Since you’re just decorating Nutter Butter cookies you don’t even have to use the oven so these are even great for your little ones to help with if you’d like. 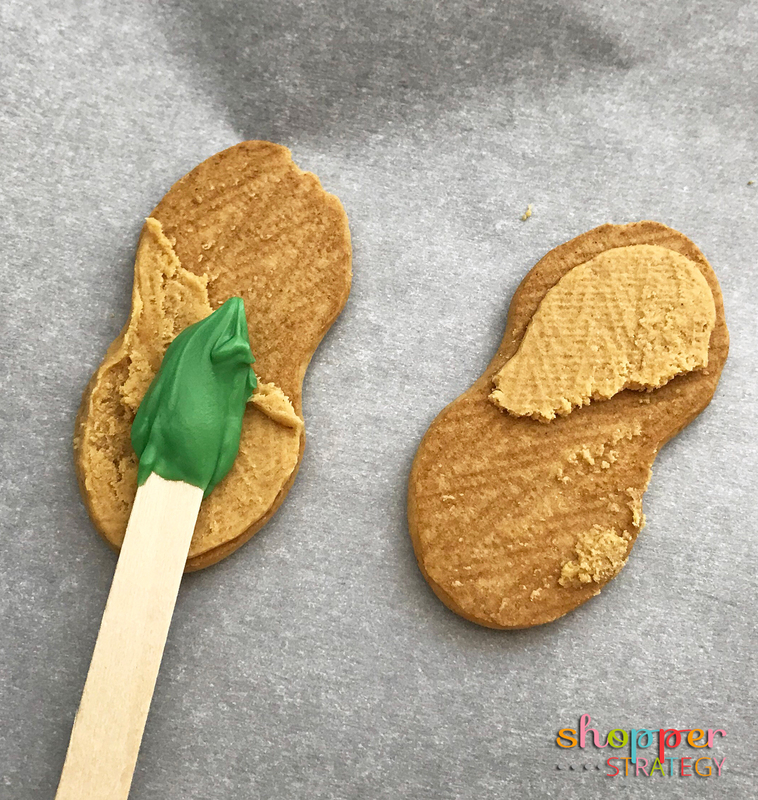 First gently break open the Nutter Butters, dip the popsicle sticks in melted green Wilton candy melts and gently press the two cookie pieces back together with the popsicle sticks in the middle. Repeat the steps above for all ten cookies and lay them out on a baking sheet lined with waxed paper. Put the cookie sheet in the refrigerator for twenty minutes to let the chocolate set. You may need to re-melt the chocolate in the microwave a little before you begin dipping the cookies. Cover each cookie well, letting any excess chocolate drip back into the bowl. Once all the cookies are dipped place them back in the fridge for twenty minutes and allow the chocolate to set. 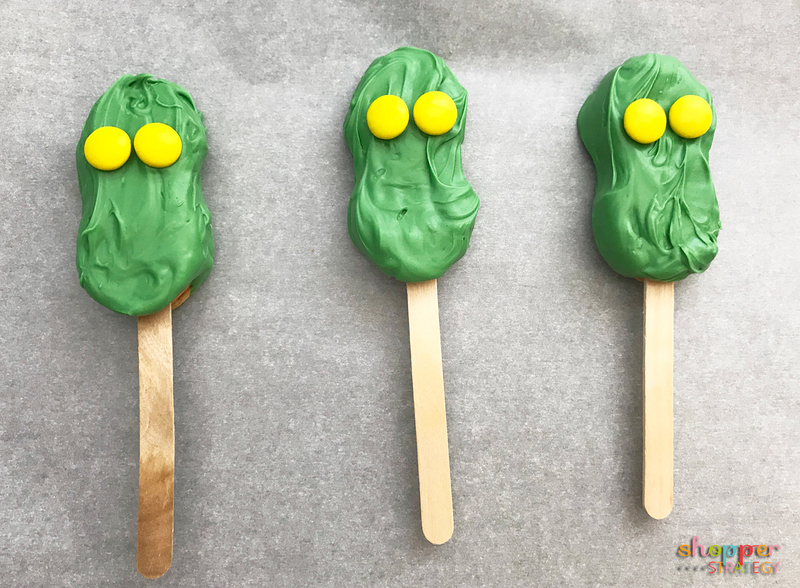 After the chocolate sets up use a small dollop of Wilton black icing and two yellow M&Ms to give each Grinch a set of eyes. 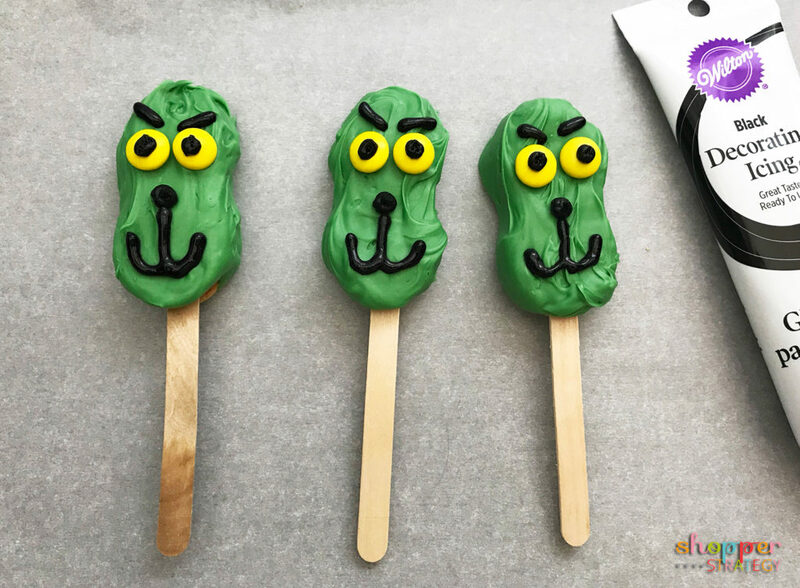 For the final step, give each Grinch a nose, mouth and eyebrows using the Wilton black icing and icing tips. Next see how fast these yummy treats disappear! Pour the 10 oz package of Wilton candy melts into a microwave safe dish. Heat in 30 second increments, stirring occasionally until melted. Repeat this step with all 10 cookies and then place the cookie sheet in the fridge for 20 minutes to set. Re-melt the chocolate if needed and dip each Nutter Butter into the melted chocolate letting the excess drip back into the bowl. Place on the baking sheet and repeat until all cookies are dipped. Place in the fridge again to let the chocolate set. Once set give each Grinch 2 eyes using the yellow M&M's and a small dollop of black icing. Lastly give each Grinch a black nose and a mouth. We LOVE Nutter Butter cookies, so I know we’ll be making some of these! They look so good I can almost taste them now!